Math concepts such as counting, money, time, shapes, patterns, addition and more are covered. 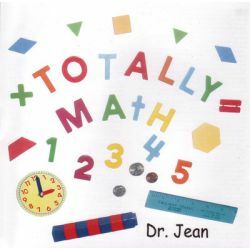 Some of the titles are: Clock Rock, Shape-A-Loo, Fraction Pizza, Numbers You Should Know, Country Countdown, Five Little Crabs and more. Twenty-five tunes in all.